2. 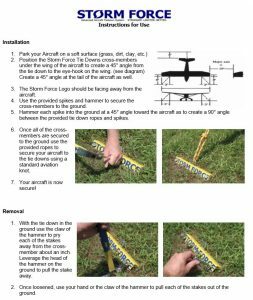 Position the Storm Force Tie Downs cross-members under the wing of the aircraft to create a 45° angle from the tie down to the eye-hook on the wing. (see diagram) Create a 45° angle at the tail of the aircraft as well. 3. The Storm Force Logo should be facing away from the aircraft. 4. Use the provided spikes and hammer to secure the cross-members to the ground. 5. Hammer each spike into the ground at a 45° angle toward the aircraft as to create a 90° angle between the provided tie down ropes and spikes. 6. Once all of the crossmembers are secured to the ground use the provided ropes to secure your aircraft to the tie downs using a standard aviation knot. 7. Your aircraft is now secure! 1. With the tie down in the ground use the claw of the hammer to pry each of the stakes away from the crossmember about an inch. Leverage the head of the hammer on the ground to pull the stake away. 2. Once loosened, use your hand or the claw of the hammer to pull each of the stakes out of the ground.